I've been a little obsessed with all things nautical lately, so I made this little number to help my oldest sail through her school year. I'll be showing you how I refashioned a men's shirt into this adorable neck tie top. I also have a tutorial for the gabardine flat front skirt. It can be recreated in any size with a variety of fabrics. Let's start with the shirt. -a men's shirt with no front pockets and wide enough to cut smaller shirt and strips for neck tie. - a shirt to use as a pattern, pick one without a separate sleeve. I turned my shirt inside out centered it over the buttons. Because the final shirt won't stretch like the t-shirt I added a couple inches to the sides as I cut it out. After cutting, I separated my front piece from the back, folded it in half and cut a lower neck line. Pin front and back right sides together at the shoulders. Sew and finish edges. Because my fabric had some good stretch to it I was able to make my own biased tape with scraps of the shirt. If you use a traditional cotton shirt you will want to buy or make matching biased tape with another piece of fabric. Pin, sew and finish the edges. Going back to my shirt, I cut 4 strips of fabric 1-3/4" wide. I cut them as long as the shirt would allow. I sewed ends of the strips together to make two really long strips. Then I sewed the two long strips right sides together all the way around leaving a small gap, which I used to turn the tube right side out. Once turned, I ironed and topstitch the tie. Step 7: finish and fold under neck edges. I serged my neck edges and ironed them under. If you don't have a serger you may want to do a double fold. Step 8: pin a sew on tie. Lining up the center of the tie and the center of the back, I pinned the tie around the neck. Leave an opening in the front about 2" from the edge, so you'll have room to tie a knot. Stitch around the neck, overlapping the top stitch on tie. Step 9: top stitch opening in front. Secure the folded neckline in the front by topstitching as close to the tie as possible. Step 10: Hem bottom and you are done. The length and width of these pieces will depend on the size of your child. I will tell you how I did it based on the size of my child who has a 24" waist. Match up the same sized strips and sew right sides together across the top. After sewing a seam across the 4"X 15" strips, you'll sew the elastic band onto one of the stripes just below the seam. Sew it to only one of the pieces do not sew through both or you won't be able to turn it right side out. Step 3: Press seams open. These will be the front and back of your skirts waist band. The elastic piece will go in the back. With panels still open pin front to back right sides together and sew up the sides. You will have a tube when you are done. Fold the waistband in half right sides out and topstitch the top and then over the waistband securing it in place. Step 6: Sew skirt sides and gather. 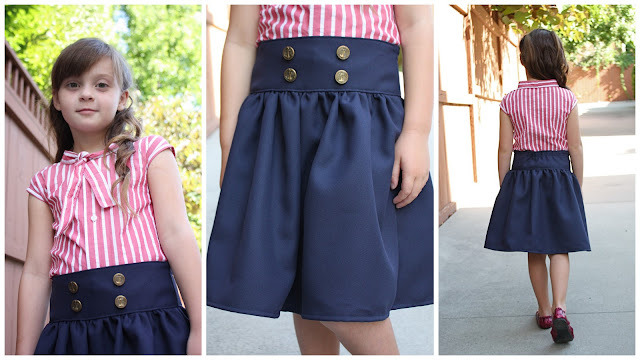 grab your larger skirt pieces and sew the ends right sides together. Gather the top to the size of your waist band. Step 7: attach the skirt to the waistband. pin and sew skirt to waistband matching up sides. Topstitch gather to waistband and add buttons. Please let me know if you have any questions or if I left anything out. Very resourceful! I love it! LOVE the shoes too! I just have one word for you : STICKER! Make sure you visit my blog on Saturday you are getting featured during STICKER TIME! I love it and she looks adorable. Thanks for sharing the tutorial. That is darling! I just love it! great job! So cute. i just pinned it. Oh wow that is adorable! I have to start sewing clothes ASAP! Very cute outfit. I love the shoes too! Be still my heart!!!! This is one of the cutest little dresses things I have ever seen! Might have to modify it to be my size! Oh, I love this! I love that you used a men's dress shirt to make this top too. could you make this for an adult?also how hard would you consider this to be?i am a new sew-er and I am not that good at it.